Preference Optimization or P+Op, runs your job 10 or more times,to compare the cost of different bolt sizes and different connection types. If it is a “mandated” job where the Engineer mandates all of the connection standards, then QuickQnect can easily mimic the mandated standards. You could also choose to get an override from the Engineer for all Qnect connections. This is commonly done and will add significantly to the optimization savings total. Bolt Optimization or B+Op will use your priority bolt sizes (up to three) and will try to make the most efficient connections allowable by AISC engineering requirements. Our computer algorithms may give you vertical spacings of 3”, 3.5”, 4”, 4.5”, 5”, 5.5”, or 6”. You can limit it to the conventional 3” or to any subset with simple selections. You should expect anywhere from 20-50% reduction in the number of bolts, bolt holes, time for bolting, machine use, skilled laborers needed, and erection time. Qnect automatically recognizes “doubler” requirements (need to reinforce the web due to a cope). Qnect offers a doubler report so you can see exactly which members required doublers. Now, you can act very early on to upsize the beam or reduce the load, thereby eliminating the doubler condition. The Doubler Report will indicate the maximum load for each affected member in order to eliminate the doublers. 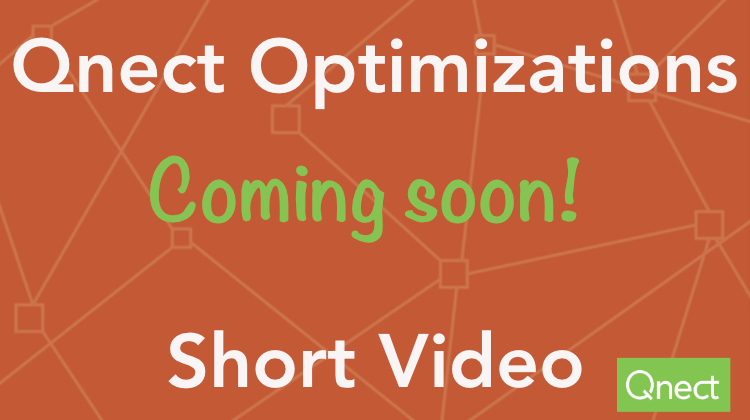 This video series walks you through what you need to know about Qnect's Optimizations. Learn how using Optimization on your next project can reduce schedule uncertainty, increase your margins and contribute to the estimodeling process.